ELECTRONA, AUSTRALIA - The island of Tasmania has long been renowned for producing some of Australia’s tastiest seafood. But when warming seas allowed a foreign species of sea urchin to move farther south, devastating valuable fisheries, local businesses tried to innovate and ended up fostering a new industry whose products are popular overseas, including in Japan. Located about 30 minutes south of Hobart, the state capital, Ralph’s Tasmanian Seafood began processing sea urchins in 2017 as an experiment when wild abalone stocks were declining due to an infestation of long-spined sea urchins. 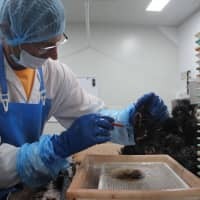 The company, which always focused on exporting abalone taken from the wild, is now the only exporter of Tasmanian long-spined sea urchin roe. “Over the past 15 years, populations of long-spined sea urchins have started to destroy the environment up and down the east coast of Tasmania. That’s impacted not only the abalone industry but also the rock lobster industry as well,” said sea urchin processing manager Simon Leonard. Now running at full capacity, Ralph’s Tasmanian Seafood processes 15 to 20 tons of sea urchin a week, which is then sold to buyers in Japan, the United States, Malaysia, Singapore and Hong Kong, as well as domestically at the Sydney fish markets and to high-end restaurants. “Basically, we see it as an opportunity to not only do something to help the environment, but also turn a pest into profit,” Leonard, 38, said. Long-spined sea urchins — not to be confused with the short-spined variety, which is native to Tasmania — arrived in Tasmania from the Australian mainland via the East Australian Current. “Over the last 40 years our winter water temperatures have gone up a couple of degrees and it’s passed the threshold where the (sea urchin) larvae develop, which is 12 degrees” Celsius, said John Keane of the University of Tasmania’s Institute for Marine and Antarctic Studies. 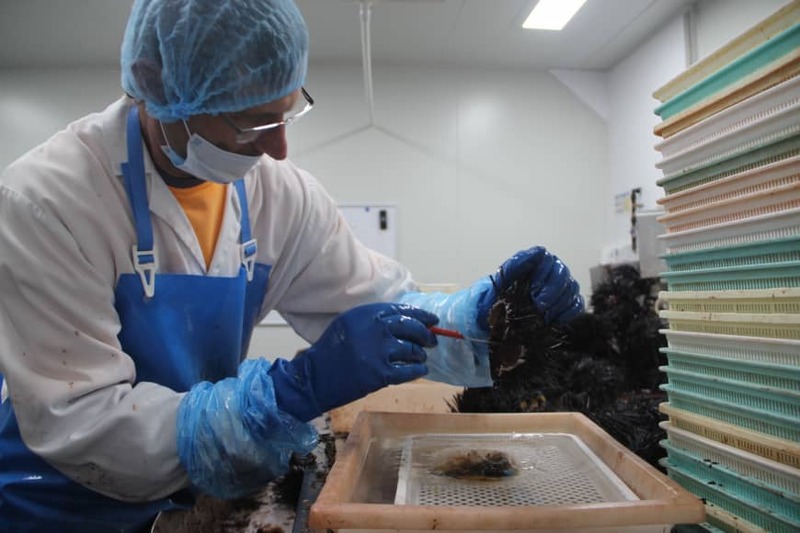 The research fellow explained that Tasmanian water temperatures in the winter have risen to 13 degrees, from 11 degrees, creating conditions where sea urchin larvae are able to develop into adults. Keane said the long-spined sea urchin was first sighted in Tasmania in 1978 but started to have a severe impact on local ecosystems about 15 years ago. He said that as of December there were an estimated 18 million long-spined sea urchins in Tasmania. The urchins graze on kelp, and in their large numbers they turn healthy reef ecosystems into “barrens,” or large areas of rock stripped of vegetation and other wildlife. “Now on the east coast of Tasmania, 15 percent of our reefs are sea urchin barren and that is increasing,” Keane said. Encouraging commercial fishing operations of sea urchins is part of the government’s multipronged approach to keeping long-spined sea urchin numbers in check and protecting the state’s abalone industry, which is worth 300 million Australian dollar (¥24 billion) a year. However, as urchin roe is not often found on Australian dinner plates, Ralph’s Tasmanian Seafood has focused its efforts on exports; particularly on breaking into the Japanese market, where sea urchin roe is a popular delicacy in sushi bars. 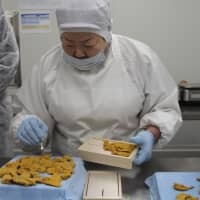 To meet Japan’s high standards for product presentation, the company hired an urchin roe technician from Japan to teach local staff how to select and pack the product. Affectionately called “Big Mumma” by her Australian co-workers, 42-year-old Nobuko Honzana has 24 years of experience in the industry and leads a 12-person packing team. “It’s delicious,” the president of Shinkou Trading said on her first visit to the processing factory. 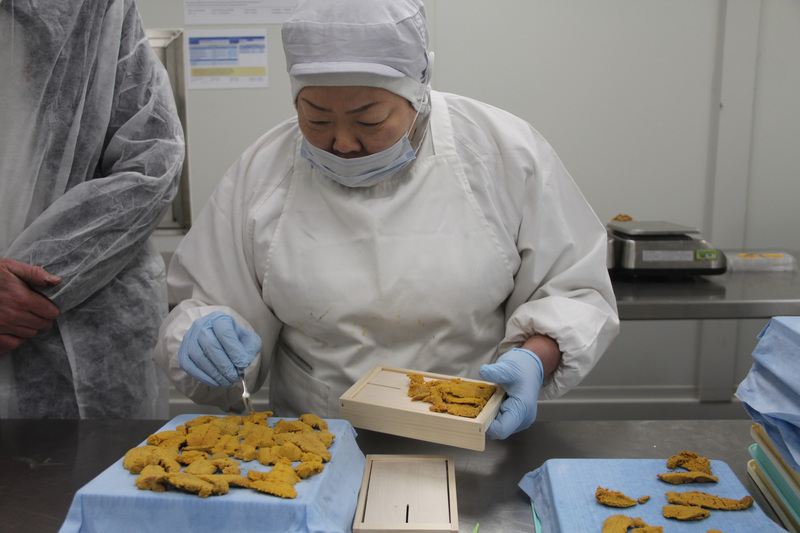 “It has a strong flavor and there is a good amount of fat,” she said, comparing the flavor to Japanese murasaki uni, a type of sea urchin popular in Japan. Once in Japan, the Tasmanian product is sold at the new Toyosu fish market in Tokyo, where it is primarily bought by operators of conveyer-belt sushi restaurants. However, staff at Ralph’s Tasmanian Seafood admit they have a long way to go before they can say they have a comfortable foothold in the Japanese market. “Our understanding of where it is being consumed in Japan and why it’s being consumed is still lacking,” said David Hogg, chairman of RTS Pauaco, the parent company of Ralph’s Tasmanian Seafood. In the meantime, Leonard’s message to consumers is simple.